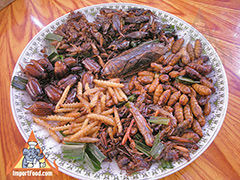 Many people in Thailand enjoy eating insects as a snack food, often enjoyed with beer. They're usually fried in a wok, and seasoned with Golden Mountainsauce & a bit of Thai pepper powder. If you don't find street vendors selling fried insects, for sure you can always find them at Temple Fairs throughout Thailand. Temple Fairs help raise money for the temple, and sometimes last a whole week whereby all kinds of food & clothing is sold, along with traditional entertainment. Temple Fairs are held by each temple about once a year, and they offer not only a glimpse into the real heart of Thai culture but also provide a certain venue for you find tasty fried insects for sale. One of the most common insects for snacking, it's a cricket. Fry it in a wok briefly, remove, add a light coating of Golden Mountain sauce and add Thai pepper powder. Eat as a snack alone, or with beer. Click image to see larger Jing Leed pictures. Similar to other Thai insects, fry the maeng kee noon in a wok briefly, remove, add a light coating of Golden Mountain sauce and add Thai pepper powder. Eat as a snack alone, or with beer. 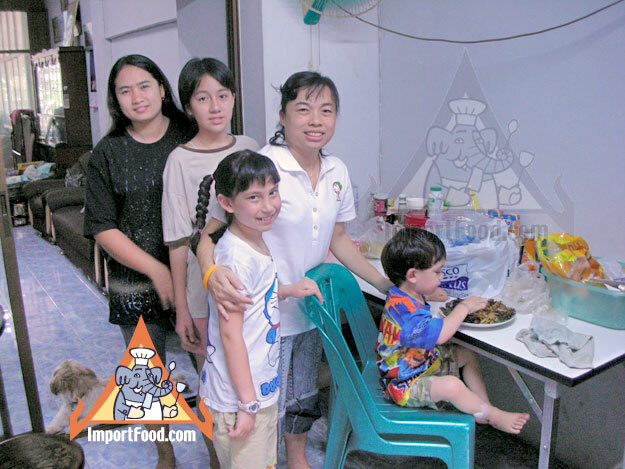 Click image to see larger Maeng Kee Noon pictures. Non Mai Non means worm in Thai and Mai means wood. 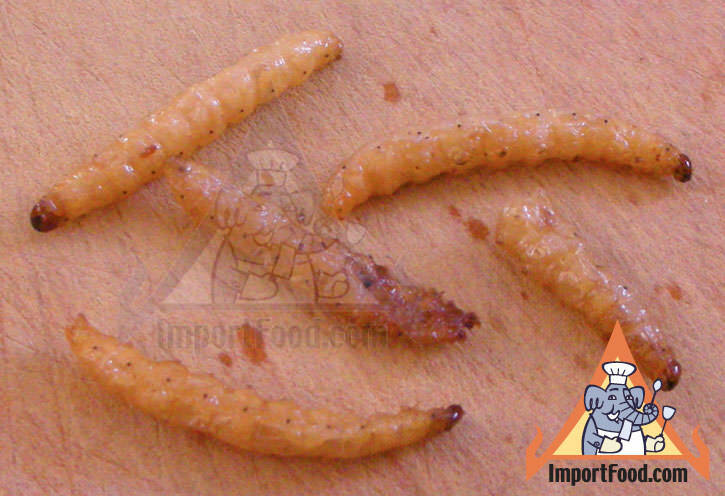 This is a wood worm insect with a soft shell that's crispy after fried. Fry the non mai in a wok briefly, remove, add a light coating of Golden Mountain sauce and add Thai pepper powder. Eat as a snack alone, or with beer. Click image to see larger non mai pictures. Non means worm in Thai and Pai means bamboo. 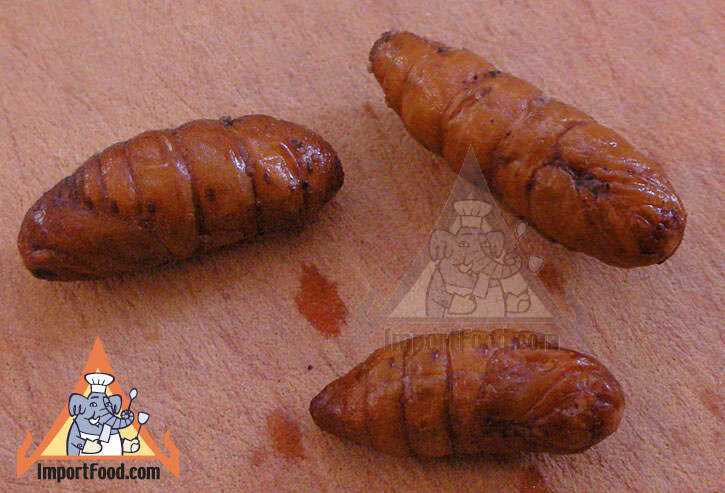 This is a bamboo worm insect and one we found to be the most tasty. Anyone who likes Cheetos would love it. A nice hint of corn, slightly fibrous. Our 2 year old son couldn't stop eating them on a recent trip. Also known as "Rot Duan", which means "Fast Train". Fry the non pai in a wok briefly, remove, add a light coating of Golden Mountain sauce and add Thai pepper powder. Eat as a snack alone, or with beer. Click image to see larger non pai pictures. 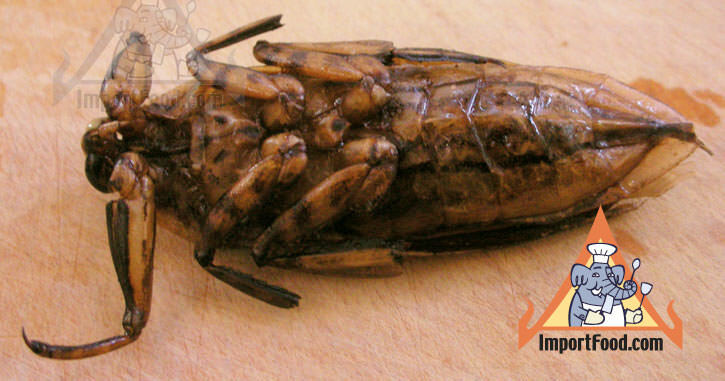 This is a common grasshopper, it was known as a pest that damaged rice crops. 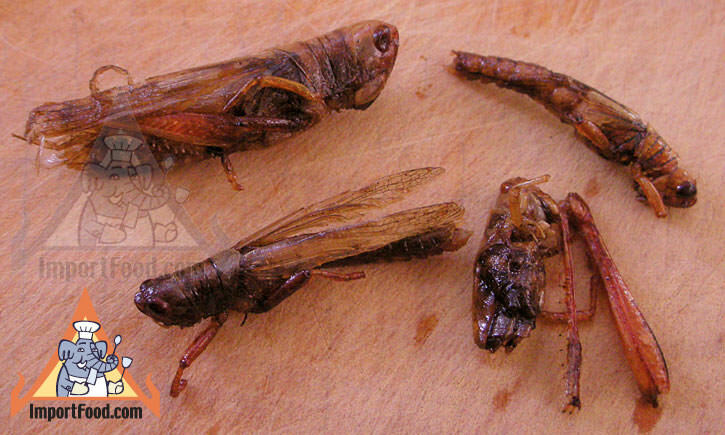 Farmers discovered they could eat the insects as a tasty snack, so they gathered them up and sold them off to vendors who turned them into a popular snack nationwide. Fry them in a wok briefly, remove, add a light coating of Golden Mountain sauce and add Thai pepper powder. Eat as a snack alone, or with beer. Click image to see larger non pai pictures. 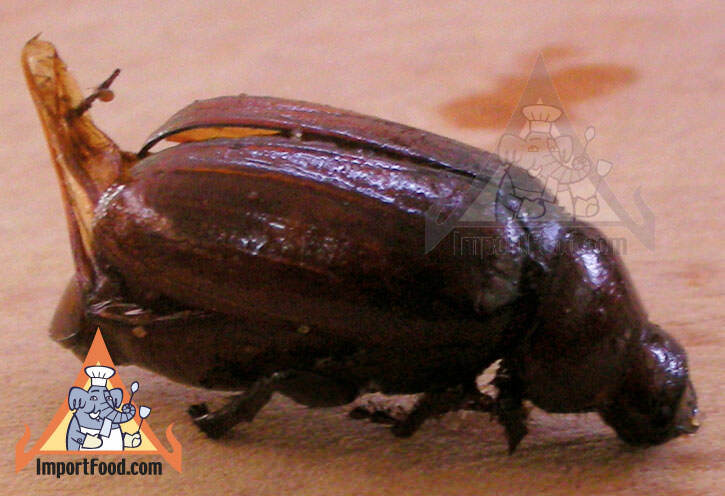 This is by far the largest insect eaten as a snack. At about 3.5" long it's not something the average tourist to Thailand might munch between meals, but it is enjoyed by many locals as a snack, notably in the NE region. As with other insects, fry it in a wok then season with a bit of Golden Mountain sauce and Thai pepper powder. The head and the shell directly behind the head is not eaten, as it is too hard. To eat whole, locals rip off the pincers and eat those, then rip the head and top section off and discard, eating the rest whole. Some people discard the wings, and others enjoy eating them. Maengda essence is also made into namprik. 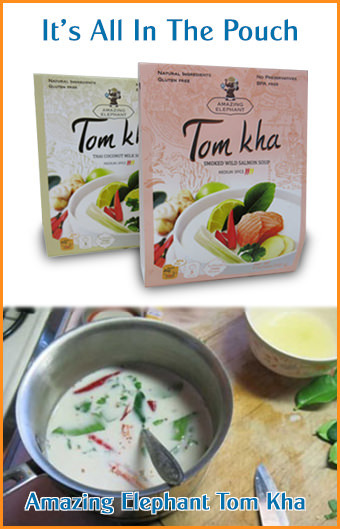 Add a few drops of maengda essence in a mortar and pestle with namprik kapi becomes namprik maengda. Maengda has a distinct aroma that many find desirable, and no other insects have the same smell. Interesting fact: the female maengda has no smell. Female maengda are enjoyed for the eggs and the taste as a snack. Male maengda have the particular smell, and are used to make the special namprik (chile paste). If you pinch the body in the middle, bend it backward and smell the stomache area, you will know if the maengda is a male or female. Also called maengda but having no resemblance, is "maengda talay". Maengda talay is the Thai horseshoe crab, found in the Gulf of Thailand and enjoyed as a delicacy.